Homer bills itself as the “end of the road” because from here the only place you can go is by boat to Kodiak. Yes, this really is the end of the great North American road system. We had seen this wonderful seaside town back in 2002, but barely had 24 hours to enjoy it before racing back to Anchorage to catch our plane. We vowed to return and spend some time here. 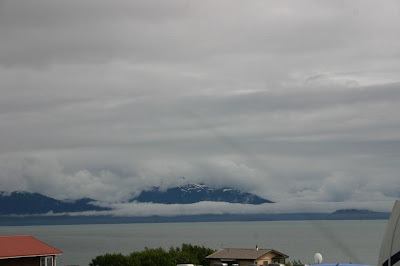 Like the first time we came here, it was very gray out and the fog lingered on the mountains across the way, hiding all of the glaciers when we arrived. At least it wasn’t raining. 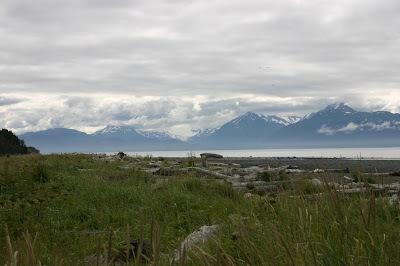 We checked out the campgrounds down on Homer Spit, a sandbar that extends 4.5 miles out from the town. There were several to choose from, but we didn’t feel a need to be that close to the commercial fishing smells. So we drove back into town and found the Ocean View RV Park that was only 1/3 full. No problem finding a place here, plus they had nice wide sites, full hook ups, and cable with 150 channels! Plus we have beach access and a million dollar view! We signed up for 3 days, then adding another 7 days. We have now added another week to our stay here. This will be the longest we have stayed anywhere since we have been on the road except when we were unable to move on due to the flu in Tucson. Tuesday we woke up and the fog had lifted, by lunch time the sun was out! YEAH!! What a dramatic difference up here when there’s sun!! 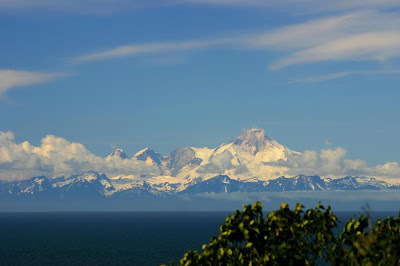 We could see a lot more of the glaciers and grand mountains around Kachemak Bay! Off we went to visit the Spit. It is a unique place, with all kinds of charter fishing trips being booked left and right. The sockeye salmon season is over, but the halibut trips were all successful. 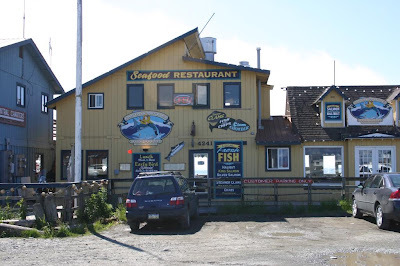 We had a great lunch at Captain Pattie’s, tasting some of that wonderful fresh halibut! There is nothing like it. Then we checked out some of the shops and returned home to spring Raider from his “Home Alone” feeling. He needed a good romp on the beach, off leash and feeling his oats. The beaches up here don’t have too much sand, just gray or black rocks. 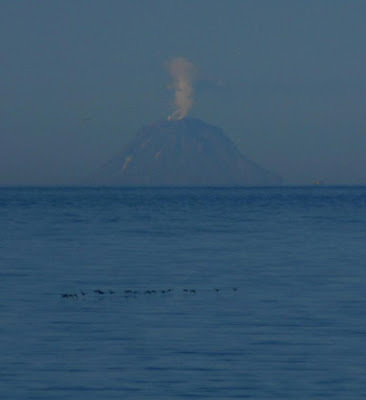 Perhaps that’s because Homer is in close proximity to at least 3 volcanoes, some still active. The next day we woke to glorious sunshine, which helped motivate us to get out and about, especially walking Raider. After tiring him out, we could take off and see the sights. We went to visit the Islands and Oceans National Wildlife Refuge Visitor Center just down the street. They had just started building this when we were here last, so it was quite impressive to see inside. There were lots of great interpretive exhibits for the region. Grant had to check out what kind of volunteer programs they have, and spoke to a refuge employee. We had been kicking around the idea of volunteering at a National Park or Wildlife Refuge in exchange for a free camp site and utilities. She was very enthusiastic and asked if we had our own RV. We told her we do. “Oh great, we pay for your site at the Ocean View RV Park during your stay here, which include your hookups and we even pay a stipend. We have two groups. One group of volunteers that comes up in April and leaves in July and another group that comes up in June and leaves in September.” She encouraged us to fill out the application because they would be planning on next summer real soon. We thanked her for the wealth of information she gave us, but it’s a little too soon to attempt a volunteer job way up here until we’ve done it down in the lower 48. It looks good on the “volunteer resume” to have prior experience. Plus, we’re still in vacation mode. Trying to see all of places we want on the road to see in the first place. However, given our absolute love of Homer, we definitely plan to come back and spend a summer as volunteers at the Islands and Oceans National Wildlife Refuge Visitor Center. We just don’t know which summer we will be doing it. We then checked out Beluga Slough and estuary out behind the visitor’s center. Bishops Beach was at the beginning of low tide, we didn't see a single shorebird just a few gulls. Thursday morning we walked on the beach from the RV Park back to Bishops Beach and still no shorebirds. 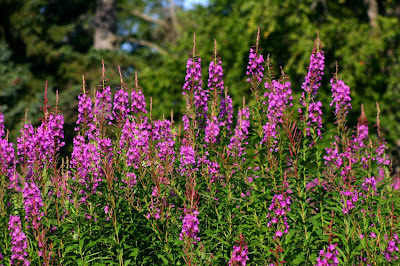 Walking back to camp we noticed all of the fields of Fireweed, a bright magenta flower that begins to flower from the bottom. 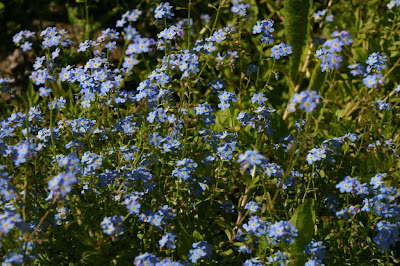 When the top blossoms are open, Alaskans know that summer will so be a memory! We decided to kick back the rest of the day and just enjoy our view. For dinner, we went to Fat Olive’s. It is an Italian place with wood fire ovens for the pizza. It came highly recommended and always has a full parking lot. Barely a block away, we walked down for an early dinner so we could get in. The pizza was incredible, maybe the best pizza we have ever had! Friday was our day for the wildlife viewing and lunch cruise. We had a perfect day, the sun was out and visibility was 60+ miles. We could see the active volcano St. Augustine 60 miles blowing steam from its top. 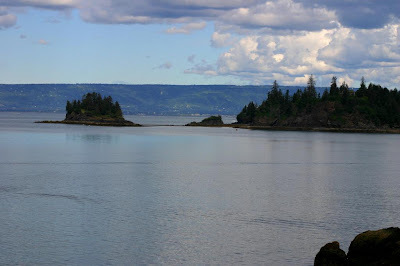 The cruise starts at the small boat harbor on the Spit and heads to “Gull Island”. 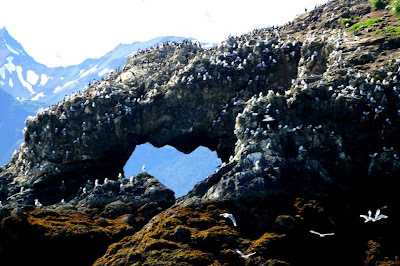 Most of the birds on “Gull Island” are Black-legged Kittiwakes. There are also Pelagic Cormorants, Tufted Puffins, Common Murres and a few Glaucous-winged Gulls. The Kittiwakes and Murres were still had nestlings and were bustling to feeding them. Our next stop was “60 foot rock”. It also would normally have Black-legged Kittiwakes, Pelagic Cormorants, Tufted Puffins, and Common Murres. 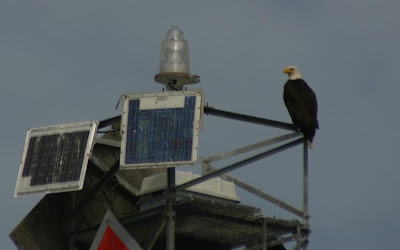 However when we arrived a Bald Eagle had taken up residence at the top of the rock and the other birds abounded from their nests for the safety of the water. The Bald Eagle apparently decided he had seen enough of us and flew off. Immediately the birds came back to check on and feed their chicks. Our finally stop was the Rookery Restaurant. This is a magnificent setting! We dined out on the balcony on this gorgeous day. The food was very good but the view and the ambiance were OUTSTANDING! Rookery Restaurant . We had a “small world” experience while on this cruise. When we were in Alaska in 2003 we did an 11 day small boat (only 60 feet long and only 6 staterooms) cruise on Prince William Sound. Christine was the 1st Mate and chef on our small boat cruise. Kathy recognized her as the guide and deckhand on the trip to the Rookery. Have you been in a place too long when you recognize the locals? NO! She definitely remembered the trip and was delighted somebody would remember her. It was a very memorable trip and Christine was a wiz in that tiny galley! Of course we would remember her!! While we were out, our quiet almost empty RV Park was descended on by two RV caravans at once, between them they had more than 40 RVs. We never cease to be amazed by the number of RV caravans we see here in Alaska. Saturday thinking that the caravaners would be heading for the Spit; we packed a picnic lunch and went up the road to Anchor Point. 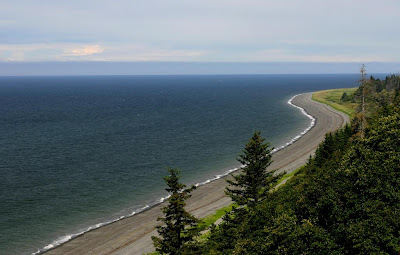 Homer may be the “end of the road” but Anchor Point is the furthest west you can drive. We stopped to chat with Gordon and Juanita who we had first met in real time last week in Soldotna for a bit. 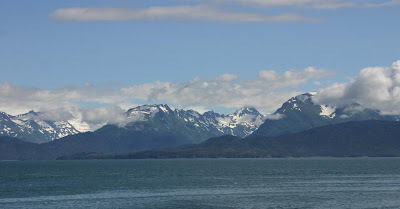 Gordon and Juanita's Alaska blog . After that we went further up the road to an Alaska State Park for our picnic. They have about 12 sites and are so small that our truck barely fit into them. There is no chance for a trailer of any kind. We had stopped there when we left Homer on our trip back to Anchorage in 2002. The park is on the edge of the cliff and has some great views, but to the north we could see mostly clouds. 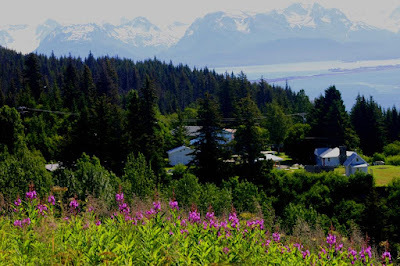 We always stay at Oceanview RV Park in Homer. They know our voice when we call and always give us the front site so we can have unobstructed views of the beautiful bay. Glad you enjoyed it too. Loved seeing AK through your lens. I sure wish summer lasted longer here so we could do more traveling, but I won't complain. Our winters are pretty special too.